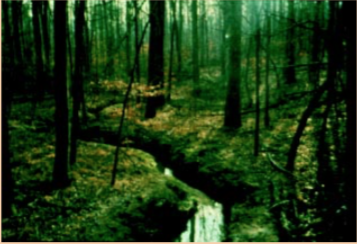 The classification of natural streams is not new. 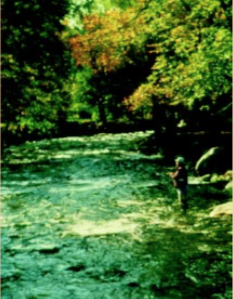 Over the past 100 years, there have been about 20 published stream classification systems. The first recognized classification was by Davis in 1899. Davis classified streams in terms of age (youthful, mature, and old age). 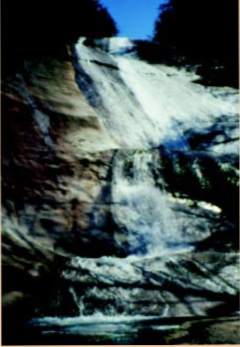 The classification systems devised between 1899 and 1970 were largely qualitative descriptions of stream features and landforms and were difficult to apply universally. In 1994, Rosgen published A Classification of Natural Rivers. 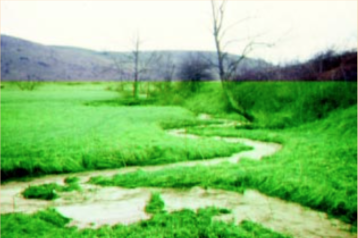 Because of its usefulness in stream restoration, this classification system has become popular among hydrologists, engineers, geomorphologists, and biologists working to restore the biological function and stability of degraded streams. 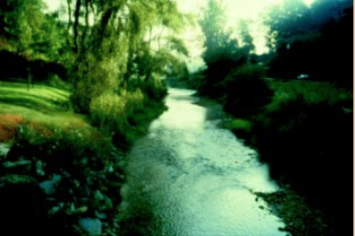 Predict a river’s behavior from its appearance. Develop specific hydraulic and sediment relationships for a given stream type. Provide a mechanism to extrapolate site-specific data to stream reaches having similar characteristics. Provide a consistent frame of reference for communicating stream morphology and condition among a variety of disciplines and interested parties. The Rosgen stream classification consists of four levels of detail ranging from broad qualitative descriptions to detailed quantitative assessments. 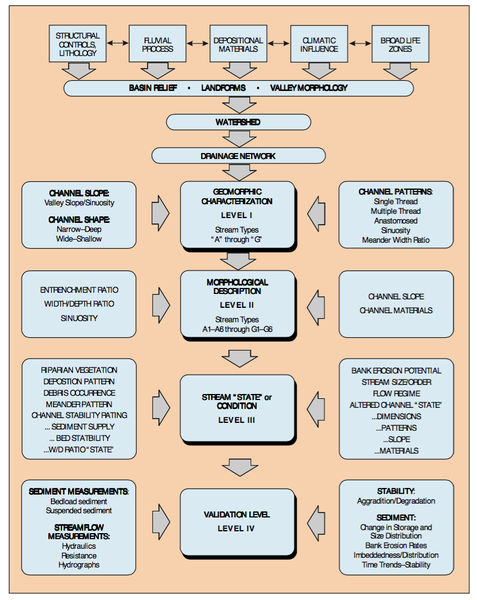 Figure 1 shows the hierarchy (Levels I through IV) of the Rosgen classification inventory and assessment. Level I is a geomorphic characterization that categorizes streams as “A,” “B,” “C,” “D,” “DA,” “E,” “F,” or “G.” Level II is called the morphological description and requires field measurements. Level II assigns a number (1 through 6) to each stream type describing the dominant bed material. Level III is an evaluation of the stream condition and it’s stability. This requires an assessment and prediction of channel erosion, riparian condition, channel modification, and other characteristics. Level IV is verification of predictions made in Level III and consists of sediment transport, stream flow, and stability measurements. Figure 1. Rosgen stream classification levels. The width/depth and entrenchment ratios used in the classification are measured at the bankfull stage. By definition, bankfull stage is the elevation of the floodplain adjacent to the active channel. If the stream is entrenched, bankfull stage is identified as a scour line, bench, or top of the point bar. If the stream is not entrenched, then bankfull is near or at the top of the bank. Relationships of bankfull cross sectional area as a function of watershed size help identify bankfull stage in the field. Bankfull stage and natural stream process terminology are further discussed in AG-590-1, Natural Stream Processes. 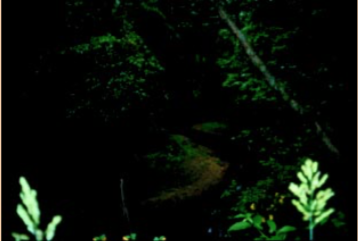 Field techniques for identifying bankfull stage are provided in AG-590-3, Finding Bankfull Stage in North Carolina Streams. 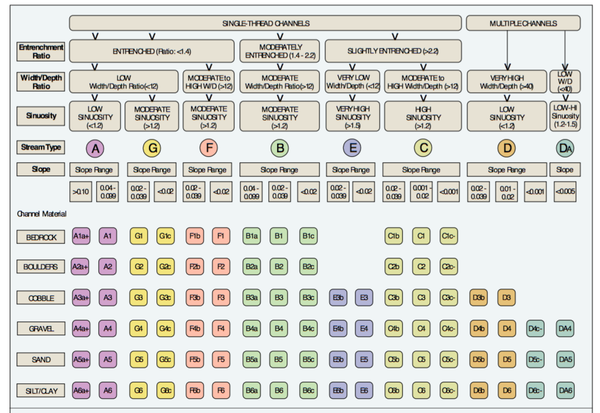 A hierarchical key to the Rosgen stream classification system is shown in Figure 2. The criteria and measurements used to classify the stream are discussed below. Single or Braided Channel Determination — A braided channel consists of three or more distinct channels. Anything less is considered a single channel. The only stream types for braided channels are “D” and “DA.” Single or braided channel determination can be made from aerial photograph or field observation. Width to Depth Ratio —The width to depth ratio is a field measurement of the bankfull width divided by the mean bankfull depth. The break between single channel classifications is 12, meaning that the bankfull width is 12 times greater than the mean bankfull depth. Stream types with width/depth ratios greater than 12 are “B,” “C,” and “F.” Stream types less than 12 are “A,” “E,” and “G.” The “D” stream types have a width/depth ratio greater than 40 and the “DA” stream types are less than 40. Sinuosity —Sinuosity is a measure of a stream’s “crookedness.” Specifically, it is the channel length divided by a straight-line valley length. The greater the number, the higher the sinuosity. Sinuosity is related to slope. 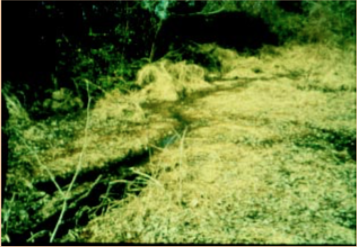 Natural streams with steep slopes have low sinuosities, and streams with low slopes typically have high sinuosities. Sinuosity can be measured from large scale aerial photographs but should not be measured from 1:24,000 or smaller scale topographic maps. Water Surface Slope — The water surface slope is a field measurement from the top of a riffle to the top of another riffle at least 20 bankfull widths downstream. This is considered the average slope. “A” and “B” stream types have the steepest slopes and “E” and “DA” stream types have the lowest. 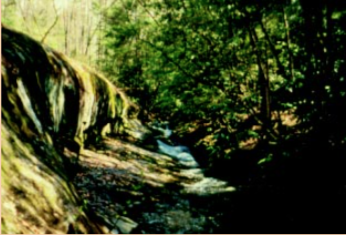 However, slope varies greatly among stream types. Median Size of the Bed Material — A pebble count procedure is used to determine the D50 of the bed material. The D50 is the median particle size, meaning that 50 percent of the material is smaller and 50 percent is larger. A stream reach of 20 bankfull widths is sampled. The reach is divided into pool and riffle sub-reaches. One hundred samples are taken from pools and riffles according to their percentage of the total length. For example, if 60 percent of the reach is a riffle and 40 percent is a pool, then 60 samples will be taken from the riffles and 40 from the pools. A cumulative frequency plot of the particle size distribution will provide the D50. The D50 will provide the following “level II” classification. Figure 2. Key to Rosgen Classification of Natural Rivers. As a function of the “continuum of physical variables” within stream reaches, values of entrenchment & sinuosity ratios can vary +/– 0.2 units; values for width/depth ratios can vary +/– 2.0 units. Figure 3. The entrenchment ratio measures the degree of channel incision as the flood-prone width divided by the bankfull width. Type “A” streams are single thread channels with a width/ depth ratio less than 12, meaning they are narrow and moder- ately deep. They are entrenched, high gradient streams with step/pool bed features. 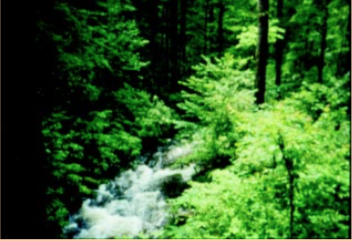 “A” streams with a channel slope greater than 10 percent are classified as “Aa+.” “A” streams flow through steep V-shaped valleys, do not have a well- developed floodplain, and are fairly straight. Type “B” streams are wider than “A” streams and have a broader valley but not a well-developed flood plain. These single thread streams are moderately entrenched with moderate to steep slopes. Type “B” streams are often rapid dominated streams with step/pool sequences. Bank heights are typically low. The high width/depth ratios and moderate entrenchment ratios make this stream type quite resilient to moderate watershed changes. Type “C” streams are riffle/pool streams with a well-developed floodplain, meanders, and point bars. These streams are wide with a width/depth ratio greater than 12. Type “C” streams are moderately entrenched, and therefore, use their floodplain during large storms. Stream Type "D" and "DA"
Type “D” streams are multi-channel (3 or more) streams. These braided streams are found in well-defined alluvial valleys. Braided channels are characterized by moderate to high bank erosion rates, depositional features such as transverse bars, and frequent shifts in bed forms. The channels are typically on the same gradient as their valley. There are few “D” streams in North Carolina. The “DA” stream type is a stable braided stream with a low but highly variable width/depth ratio (for braided channels) and low slope (less than 0.5 percent). 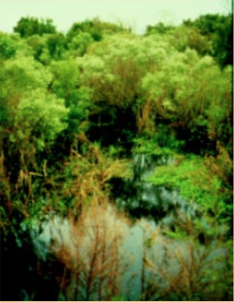 The DA stream types are found in wide alluvial valleys or deltas exhibiting interconnected channels and an abundance of wetlands. 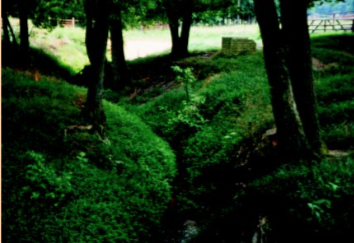 This stream type is often found in the coastal plain of North Carolina. For the single thread channels, the “E” stream types are the evolutionary end point for stream morphology and equilibrium. The “E” stream type is slightly entrenched with low width/depth ratios, and moderate to high sinuosities. The bedform features are consistent riffle/pool sequences. Analyses of North Carolina streams determined that many “E” stream types in wide floodplains have been relocated to the edge of the floodplain and straightened. This has resulted in moderate entrenchment ratios and lower sinuosities. 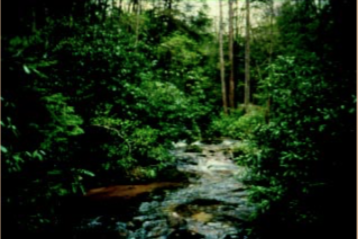 Dense vegetation has helped these streams remain as “E” stream types, but they do not function at their biological potential because of disruptions in the riffle/pool sequence. 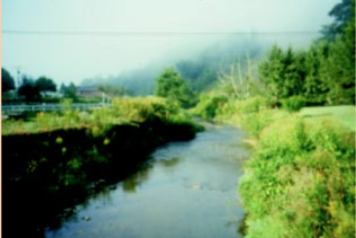 “E” stream types are generally found in wide alluvial valleys, ranging from mountain meadows to the coastal plain. The “F’ stream types are deeply entrenched, often meandering streams with a high width/depth ratio (greater than 12). These stream types are typically working to create a new floodplain at a lower elevation and will often evolve into “C” and then “E” stream types. This evolutionary process leads to very high levels of bank erosion, bar development, and sediment transport. The “F” stream types are found in low-relief valleys and gorges. The “G” or gully stream types are similar to the “F” types but with low width/depth ratios. 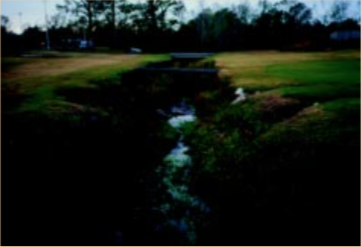 With few exceptions, “G” stream types possess high rates of bank erosion as they try to widen into an “F.” “G” stream types are found in a variety of landforms, including meadows, urban areas, and new channels within relic channels. Figure 4. Basin: Yadkin. Stream Type: A1. Figure 5. Basin: Yadkin. Stream Type: A1a+. Figure 6. Basin: Little Tennessee. Stream Type: B3. Figure 7. Basin: Catawba. Stream Type: B4c. Figure 8. Basin: French Broad. Stream Type: C5. Figure 9. Basin: French Broad. Stream Type: C4. Figure 10. Basin: Chowan. Stream Type: DA6. Figure 11. Basin: Neuse. Stream Type: DA6. Figure 12. Basin: Holston (Virginia). Stream Type: E4. Figure 13. Basin: Neuse. Stream Type: E4. Figure 14. Basin: Watauga. Stream Type: F4. Figure 15. Basin: Watauga. Stream Type: F4. Figure 16. Basin: Catawba. Stream Type: G5. Figure 17. Basin: Cape Fear. Stream Type: G6. Davis, W.M. 1899. The Geographical Cycle. Geographical Journal 14: 481-504. Rosgen, D.L. 1996. Applied River Morphology. Wildland Hydrol- ogy, Pagosa Springs, CO.
Rosgen, D.L. 1994. A Classification of Natural Rivers. Catena, vol 22: 169-199. Eisevier Science, B.V. Amsterdam. Rosgen, D.L. 1998. Stream Classification Field Guide. Wildland Hydrology, Pagosa Springs, CO.